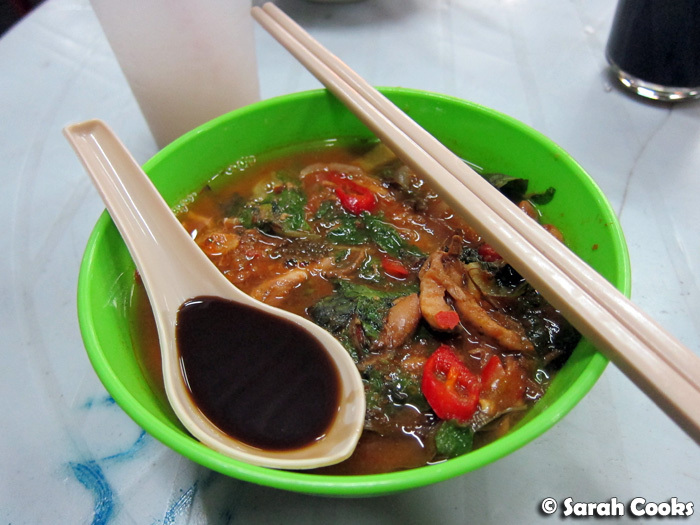 Today's post is about kopitiams and hawker food! We stayed with my Aunty Rosie, a true Penangite through and through, and she and her lovely friends hosted us and drove us around. 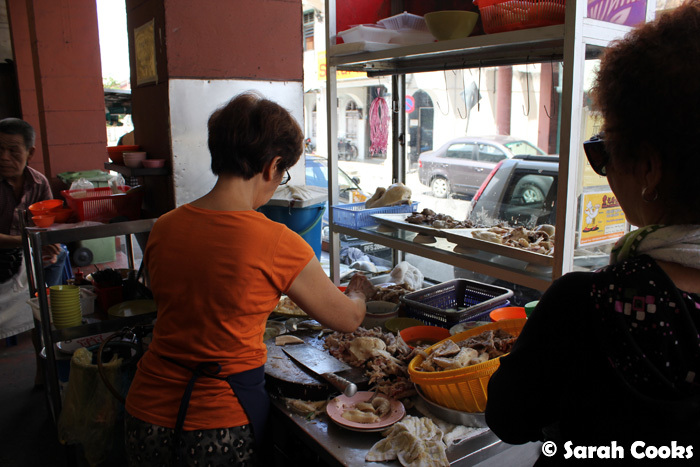 Penang people eat often, they eat a lot, and they are very fussy and vocal about their food! We were so lucky to have locals to show us where the good places were! If, like me, you're really serious about your food, I would recommend avoiding tourist magnets like the stalls in Batu Ferringhi or the big hawker centre on Gurney Drive. (The latter was once very famous, but isn't as good now as it used to be - as my dad would say, it has jato standard.) Although having said that, I wouldn't get too precious about it - I really think that any hawker center or kopitiam will give you a good feed at bargain basement prices. Goodall Cafe is, without a doubt, my favourite hawker centre in Penang. 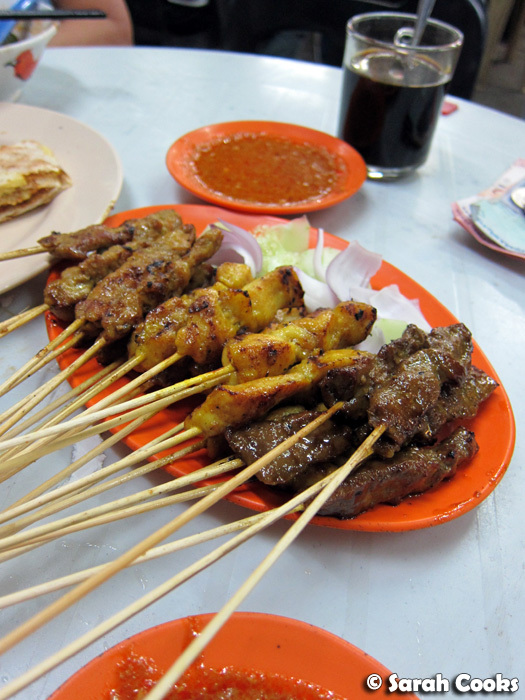 We came here one night when Pulau Tikus was all rained out and we were in the mood for satay. Luckily, Goodall has some undercover seating. I don't remember exact prices for these, but they were all around the RM3 mark. Damn cheap man! Fellow Malaysians, you know that every time you go home, you have that one night where you go nuts with food, practically inhaling bowls and bowls of noodles, sticks of satay, drinks and sweets? This was that night for me. Generally, I can't eat that much in the heat, but somehow, I managed here! One bowl assam laksa, one plate char kway teow, one glass milo peng, lots of satay and a banana roti! I requested extra bak yuu po on my Char Kway Teow. Known locally as "cholesterol pills", bak yuu po are little pieces of lard, fried until extra crispy. (You can see one piece at the front of the picture, on the rim of the plate). I'd never had it before, but had heard so much hype about it, and really wanted to try! Aunty: Waah, you dare take bak yuu po? Me: Well, on holiday one, so can lah! The char kway teow stall at Goodall doesn't add any bak yuu po unless you request it specifically, as it's quite expensive and they only have a "limited" supply. (Hence the lack of any bak yuu po on Sandra's plate, above). I even offered to pay a bit extra for a more generous serving, and they refused. Booo! I loved the crunchy little nuggets of porky goodness! Probably a good thing that I live an eight-hour flight from Penang, so I can't eat it too often. 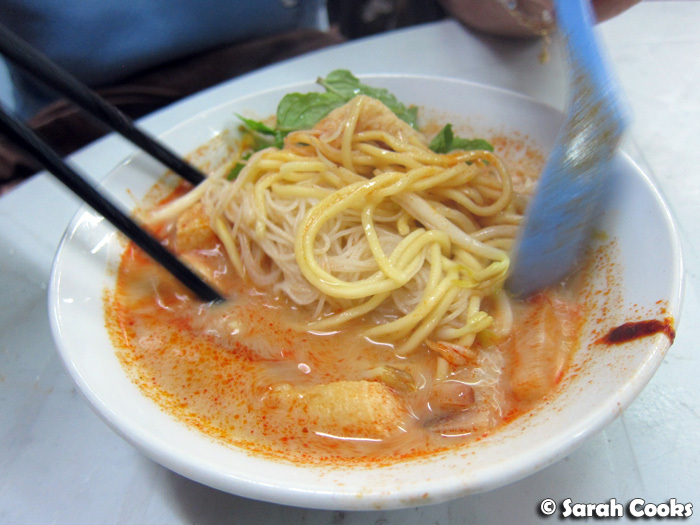 An insider's tip from one of my aunties: the wan tan mee stall on Jalan Johor, opporiste the Penang Police Station and the Penang Buddhism association is apparently very generous with their bak yuu po. I didn't get a chance to visit whilst on my trip, so go with my blessing. 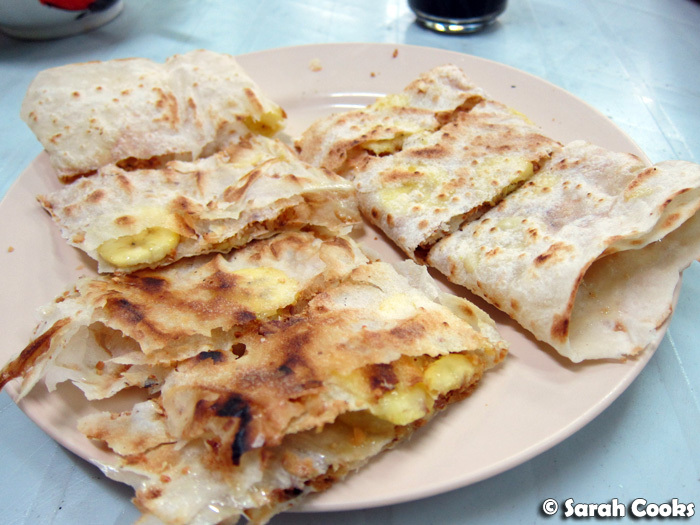 Below is, perhaps, the most delicious roti-based food I have ever eaten: banana roti! Make sure you ask them to fry it extra crispy, for extra deliciousness. Even banana-hater Sandra liked this one. Tropical banana varieties seem so much sweeter and lovelier than our Aussie ones. 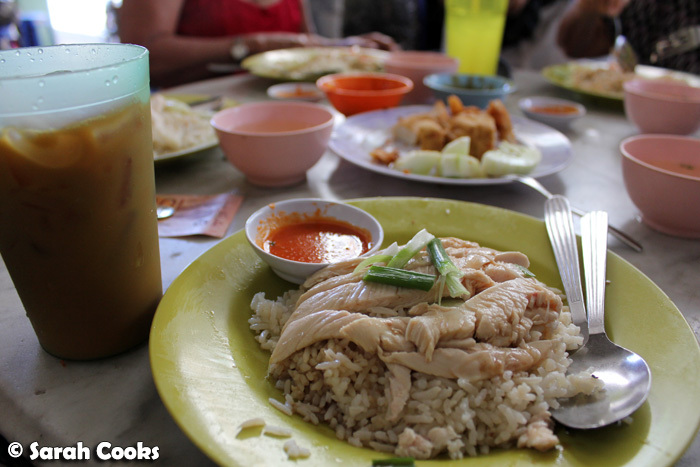 This kopitiam, I'm told, does one of the best chicken rices in town. 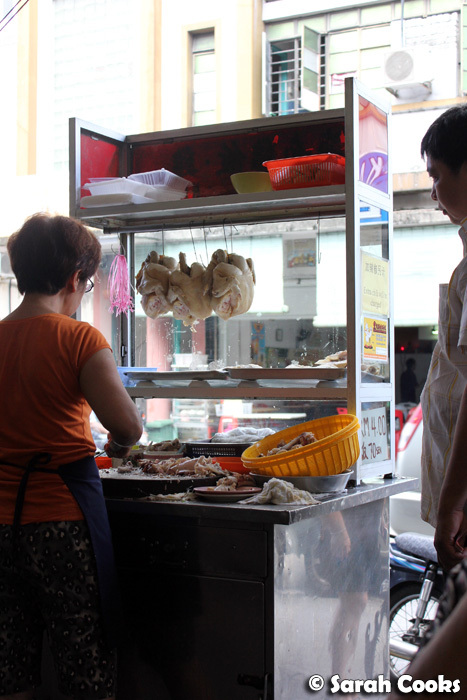 I'm also told that the chicken rice lady can be a little snobbish, but don't let that put you off! "Extra chili will be charged"
There is also a stall here famous for its fritters. 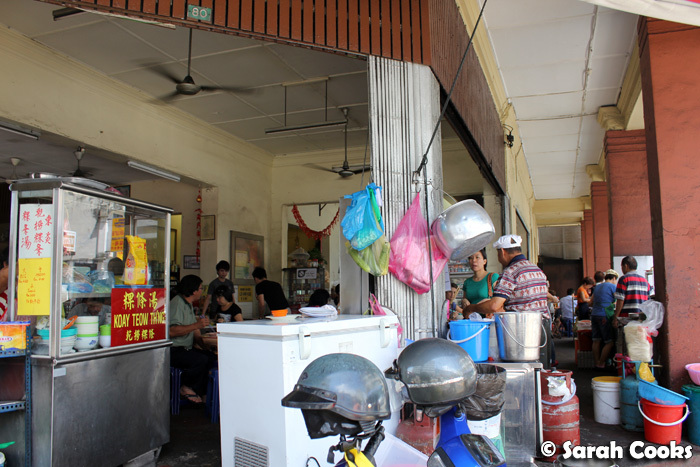 (And don't forget, in these kopitiams each of the stalls are owned and run independently). 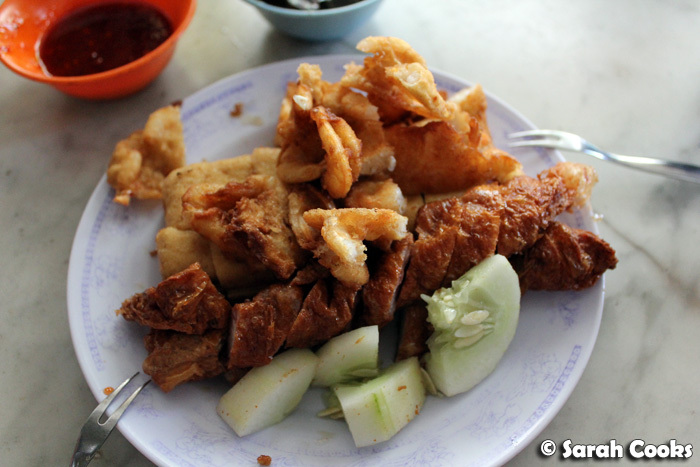 Below we have fried tofu squares, prawn fritters and, my favourite, LOH BAK! This was just gorgeous: the chicken was so tender and the rice was infused with rich chickeny flavour. (I always moisten my rice with extra chicken soup - just wonderful). 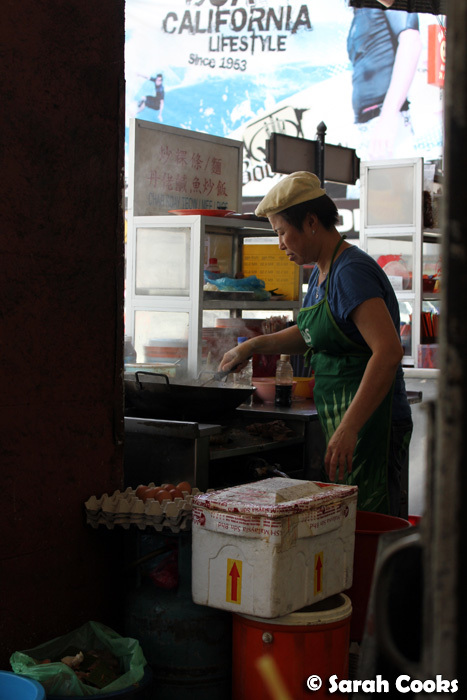 There's a char kway teow stall here, run by a lady. 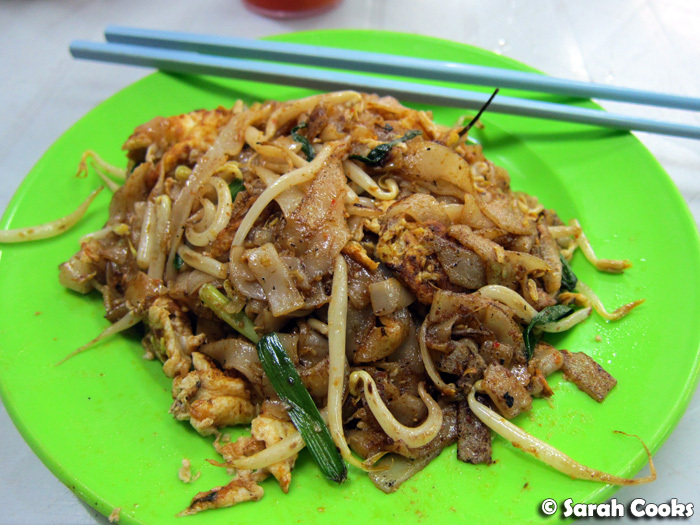 No idea why, but it seems that normally char kway teow friers are men. Reprezent! We didn't get a chance to try her char kway teow, but let's hope she is more generous with the bak yuu po than Goodall Cafe, hehehe. 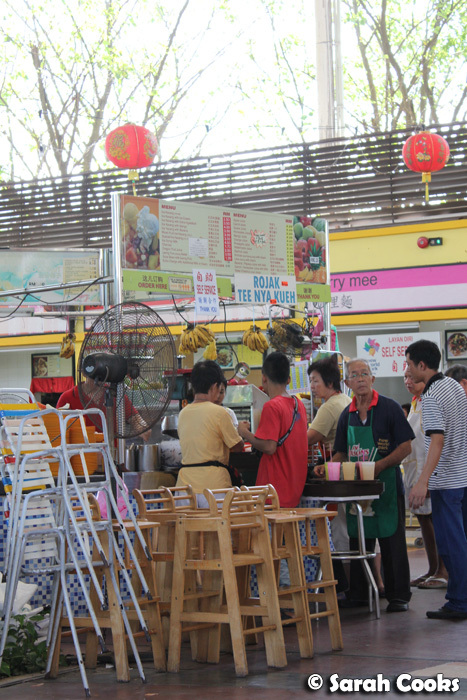 I must admit I was a little suspicious of the shiny and modern New World Park, but what happened is that a number of streetside hawker stalls were collected and moved into the one place - including the well-regarded ais kachang stall! After a long, hot and sweaty day of wandering through Penang's heritage buildings, we were in desperate need of iced refreshment. Here's my ais kacang: shaved ice, rose syrup, grass jelly, beans, and slightly salty sweet corn. It's an unusual combo, but all too perfect for the heat. 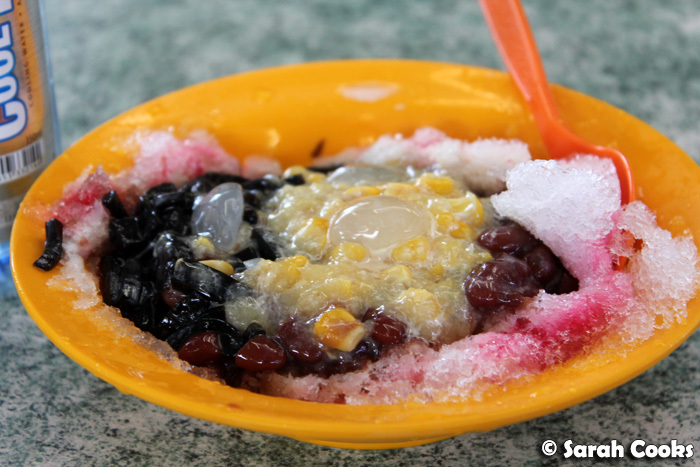 (According to the wikipedia entry, "Nowadays, ais kacang is mostly known as 'ABC' (acronym for Air Batu Campur, literally meaning "mixed Ice")" - what rubbish! As far as I'm concerned, Ais Kacang is simply Ais Kacang!! 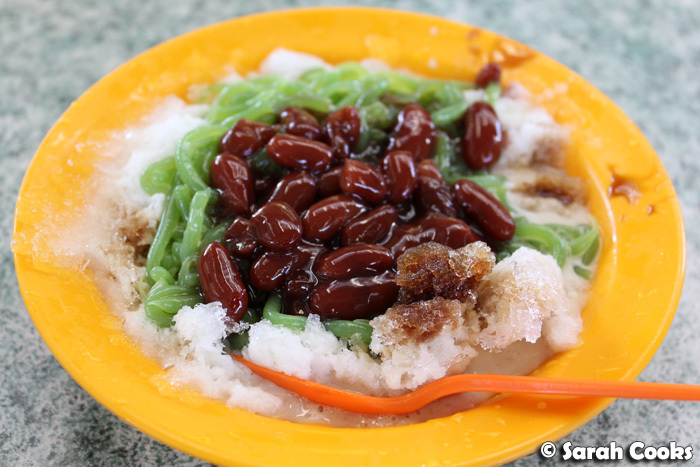 Less adventurous, but equally refreshing is the cendol: shaved ice with evaporated milk, gula melaka (brown sugar syrup), beans, and little green jelly noodles made of rice flour. 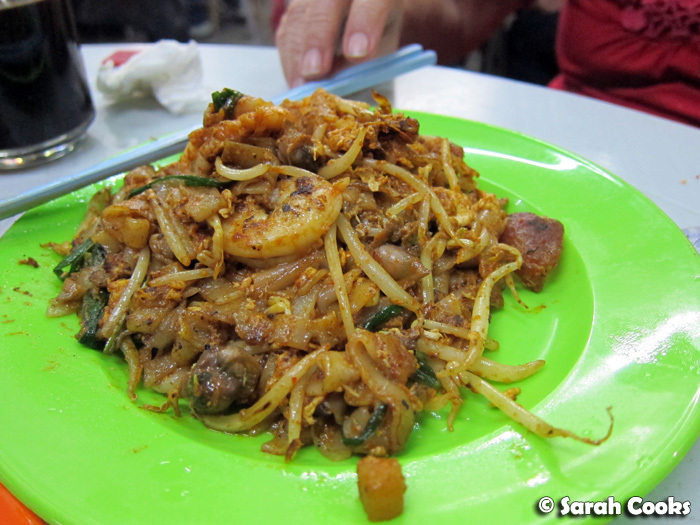 What are your favourite kopitiams and hawker stalls in Penang? 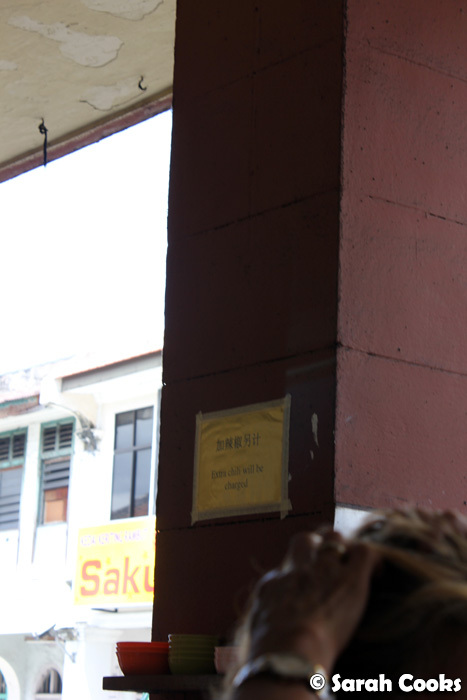 This is the second post in my series: 2012 Trip to Penang. The food at Goodall Cafe was so amazing!! I loved everything we had that night, even the weird banana roti! Sekai - The banana roti was AWESOME!!! Chopinand - Thanks for commenting! :) Hehe I'm sure I'd look pissed too, if I had to stand and stir fry all day in the Penang humidity! Great summary of the kopitiams! Goodall is a favourite among my friends and I, and I've been to that kopitiam on Penang Rd - it's pretty good. I must admit to being a wuss and not trying ais kacang yet (some of the ingredients are a bit odd from a Western perspective, you've got to admit) but I think I'll give that New World Park one a try. 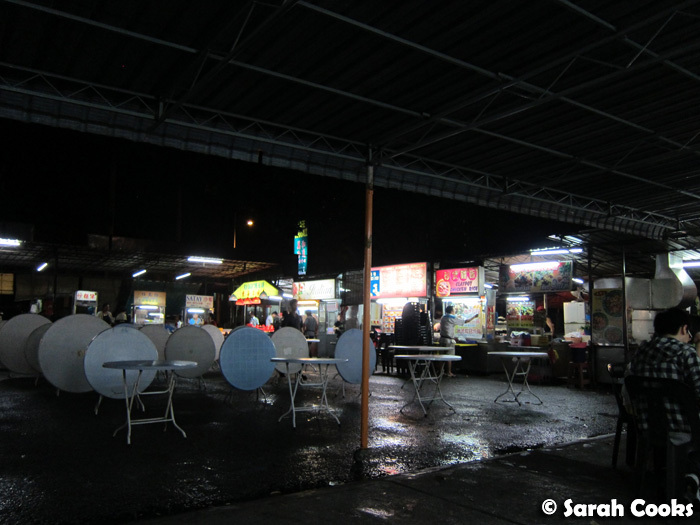 As for hawker places in Penang...Northam and Song River seem to be favourites among my friends and I, and I also like the stalls that pop up at PT markets of a night. When we lived in Tanjung Bungah (we're now in PT) Vivas, Old World in Fettes Park and a kopitiam we know as "Tanjung Tokong" were favourites of ours. There's quite a few places in Georgetown I like too, just don't remember their names. 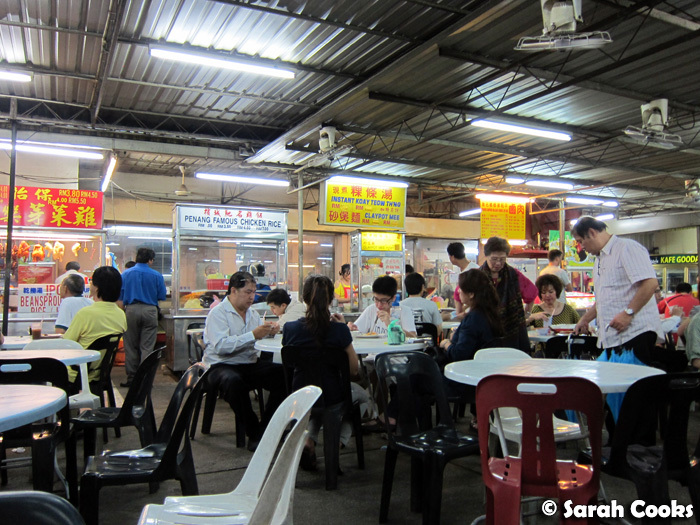 So many hawker stalls, so little time! If Ais Kachang is a bit too adventurous for you, I recommend you try Cendol first. We bought cendol for "ang mor" Sandra who doesn't like Asian desserts (red bean etc), and she quite liked it! Ais Kachang with all the trimmings is even a little bit adventurous for me, but it was exactly what I needed in the heat! We did try to go to PT markets at night but it started raining, so we packed up and went to Goodall - I'm glad we did as it was amazing! Thanks for your tips again! Yay! Your Penang food posts are making me drool though - Roti Pisang is my favourite EVER!